BRANCH MINT SPECIMEN. ONLY TWO KNOWN. 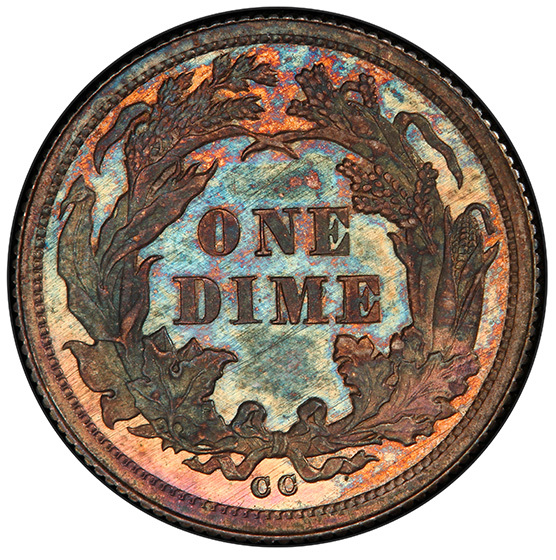 TYPE 1 REVERSE. CAC. FORTIN-121b. One hundred years after the fifty-six founding fathers signed the infamous Declaration of Independence; the United States reached a point of success unforeseen by everyone and now they were determined to prove themselves. To do this and celebrate its birthday, the country put on the Philadelphia Centennial Exhibition that hosted thirty-four countries and twenty colonies and presented several U.S. inventions. Some of the inventions exhibited included: Alexander Graham Bell’s newly patented telephone, Thomas Edison’s megaphone and phonograph, Westinghouse’s train air brake system and the largest steam engine to date that powered the entire exhibit. This not only proved that the United States was comparable to other European Nations in manufactured goods but had surpassed them in innovation. By the fair’s close in November, the attendance had topped the charts at 9.9 million, including staff, the country had accomplished its goal to prove itself, and it is credited for healing the divided wounds still left from the Civil War. Meanwhile, in the still underdeveloped but vastly expansive western territories, frontiersmen struggled with the endless barrages of justifiably-angry Native American tribes. By 1876 congress had enough and pushed the legislation through to forcefully relocate Native Americans onto a system on reservations. This decision was obviously met with resistance among several tribes but is directly attributed to the Great Sioux War of 1876 which hosted the battle of Little Big Horn. Settled in a small little valley deep in the western territories, but not as far as San Francisco, laid a small unknown town that would experience a major population boom in 1859. Carson City, established and popularized by the Comstock Lode silver boom, hosted several miners, bandits, and travelers in its earliest year. By 1863 the Carson City Mint was established but not put into production until 1870; as an odd location for a mint, the necessity for this branch grew out of the loads of silver mined relatively close, the exorbitant shipping fees to San Francisco, and the risk of theft. This mint frequently closed and reopened in its years of service until it was officially closed down and used as an assay office in 1899 due to low mine production. 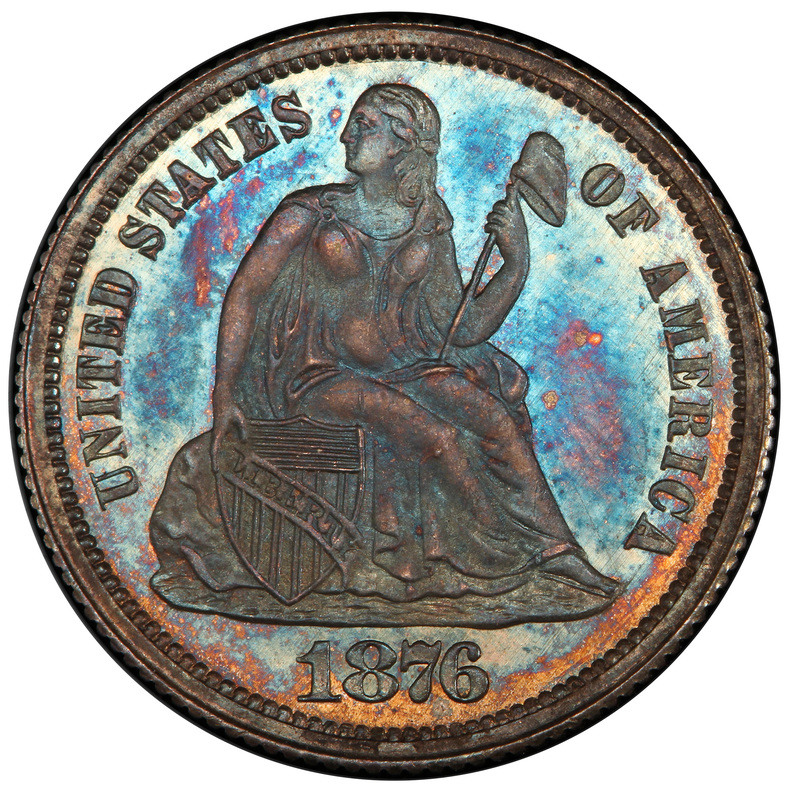 In its lifespan, however, the Carson City mint produced eight different coin denominations, including the 1876 Liberty Seated Dime. Coincidentally, the United States’ 100th birthday coincided with the Comstock mine’s peak production years. 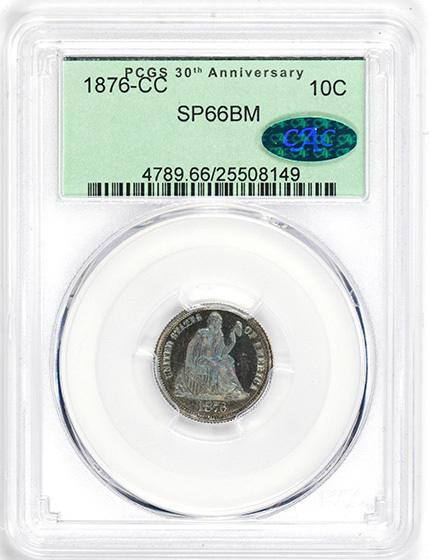 While this mint was able to mint a large number of coins this year, very few mint proofs or specimen were produced. 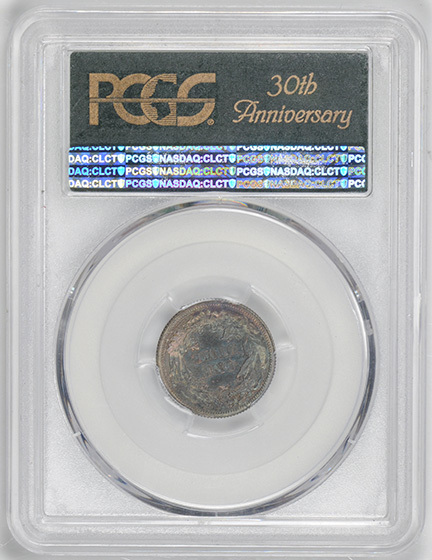 Usually mint proofs, or specimen in this case, are produced to commemorate or for presentation, but it is unclear why these specific coins were struck. Taking a look at the historical events, it is likely that these were created to commemorate both the 100th birthday and the peak production year from the Comstock mine.